Android is free. Android is a platform. Anyone can use it. Ever since its genesis in 2007, Google has gone out of its way to drive that point home. That strategy is a good way to — by sheer force — increase marketshare and, by translation, mindshare. So it’s a bit ironic when it looks like the most interesting Android tablet on the market is working very hard to not identify itself as a tablet running Android. Yes, the Amazon Kindle Fire is indeed an Android tablet at its core, but it’s more or less treating that factoid like a red-headed step child. If you head to the Kindle Fire product page and do a quick Splat-F (or Control-F for you Windows people) search, there is but one mention of Android on that entire page. The only visible tie to the Android platform that the consumer will ever see is Amazon Appstore “for Android.” And even that is something rolled out by Amazon themselves and not something directly from Google. Anything beyond that is all Amazon, all the time. And the Amazon tablet couldn’t be further from its Android brethren (and iPad, too) in philosophical approach. 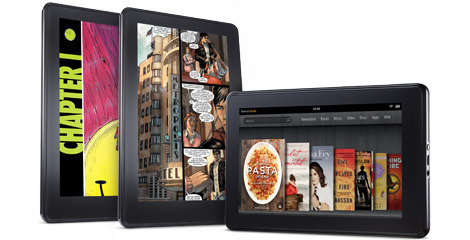 The Kindle Fire does not market itself as an iPad competitor. Amazon is intelligently carving out a niche for the Kindle fire, which lies at a price point far below that of the iPad and with an ecosystem that is focused on consuming content (e.g., movies, books, and making purchases from Amazon that much simpler). It isn’t a computing device. It’s a consuming device. If the Kindle Fire becomes one of the most popular (undercover-)Android tablets we’re going to be looking at a duopoly of tablets: one catering to the premium high-end (the iPad), and the other occupying the lower price point (the Kindle Fire). The secret? Think different. Excellent info and well written. Keep up the excellent stuff!